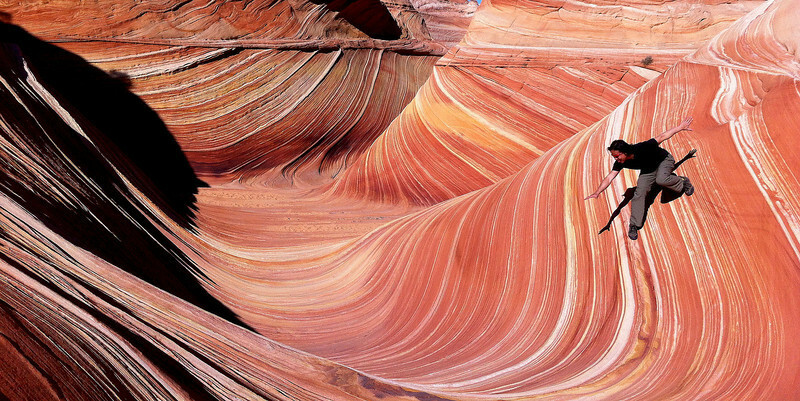 A few days ago, while talking to our fellow Canadians at the McDonald's in Moab, Jacques mentioned The Wave, a very cool-looking geologic formation, which really intrigued us. 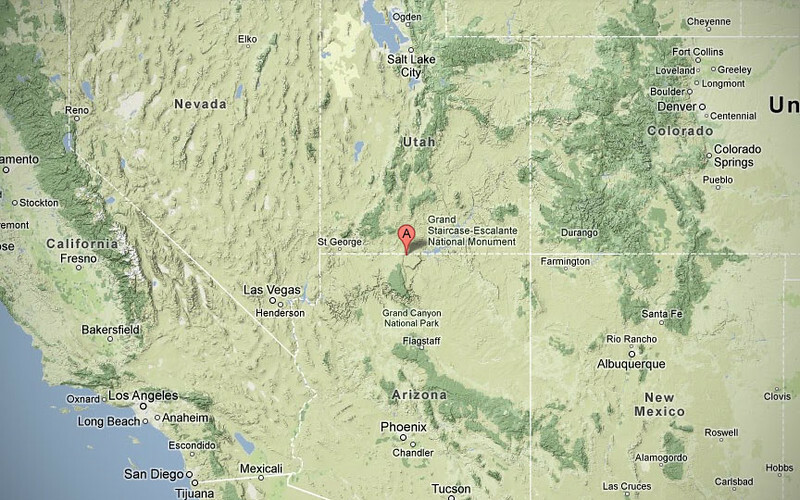 However, we found out that to visit it, we needed to obtain a permit. Unfortunately, only 20 permits are given out per day - all chosen by a lottery system. Uh oh. Apparently 10 of the 20 permits are issued 4 months in advance over the Internet, so too late for half the permits. The other 10 are picked via a manual lottery at the BLM (Bureau of Land Management) office, so we decide to take our chances there. 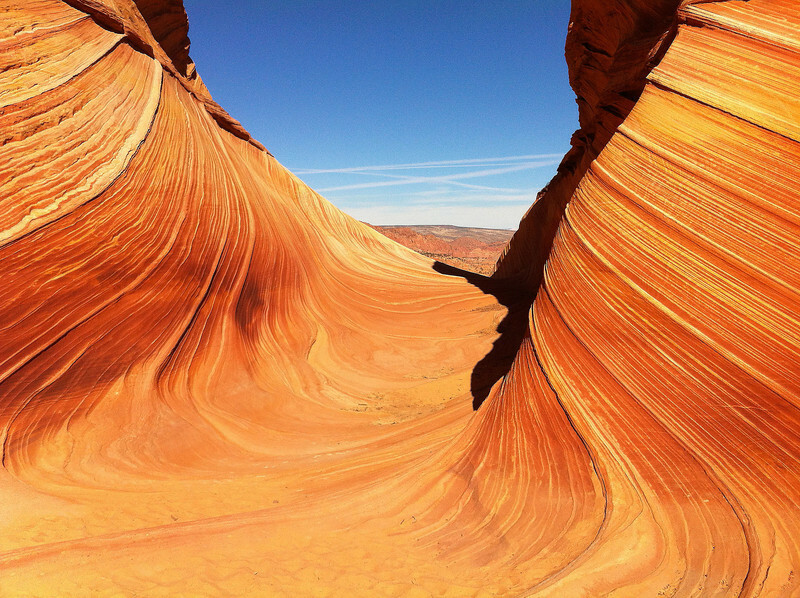 We rode all the way to south Utah, past the phenomenally large and imposing red rock mountain/sculpures of Monument Valley, but didn't stop since we had already visited it on our last trip. Our home base was set up at the town of Kanab, where the BLM office was located and we showed up bright and early the next morning for the lottery. Apparently in the summer, the number of visitors swell to over 200 people, all crammed in the tiny lottery room every morning. The largest number was 260 one day in the summer, all vying for 10 permits! Today, the BLM officer told me we had a record low of applicants - 17! 10 permits. 17 people. Our chances look pretty good! We were assigned a number and one by one, balls were drawn out of an ancient hand-cranked bingo machine, the kind that spins the balls first and spits one out of a small hole in the bottom. We didn't win. Such good odds and we were so unlucky! :( One of the permit winners, a European couple exclaimed in joy when their number was drawn. Apparently they had come every morning for the last 5 days, and finally today they won a permit! Good for them, I guess we'd come back tomorrow and try again. But we decided if we didn't win tomorrow, we'd move on. 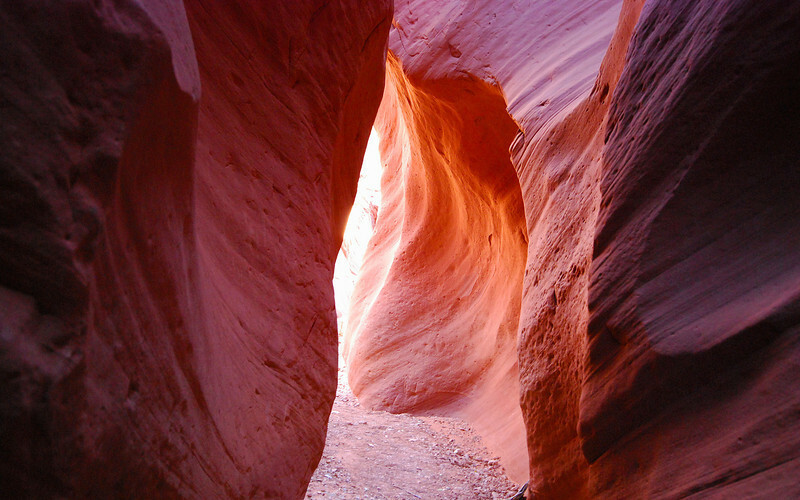 There were still a lot of other sights to see in the Grand Staircase-Escalante area. 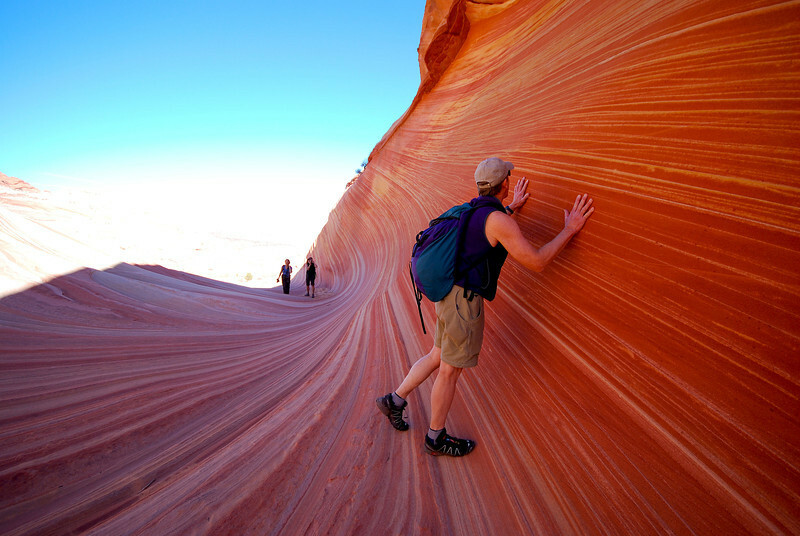 Coyote Buttes is home to a bunch of slot canyons - canyons that are far deeper than they are wide. So we rode down a 13 km dirt road to visit some of them. 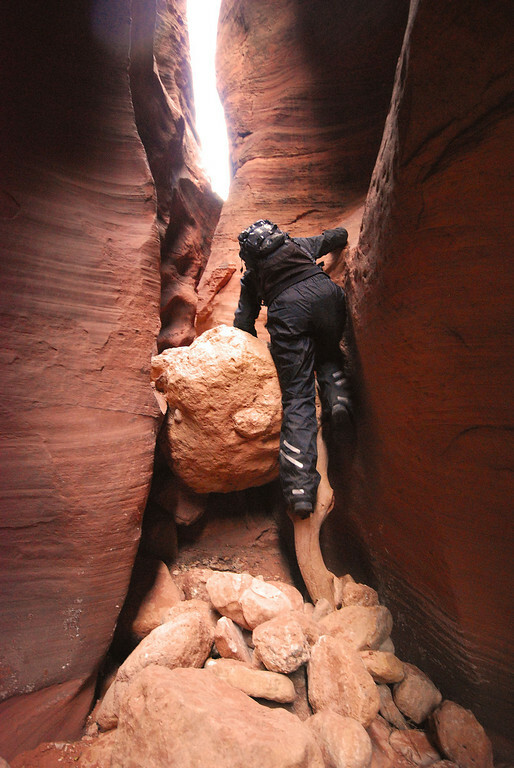 Slot canyons are very dangerous to hike in if there is any precipitation in the forecast, since the walls are 30-50 feet high and some of the longer canyons have very little open space or footholds to climb up to escape flash floods. 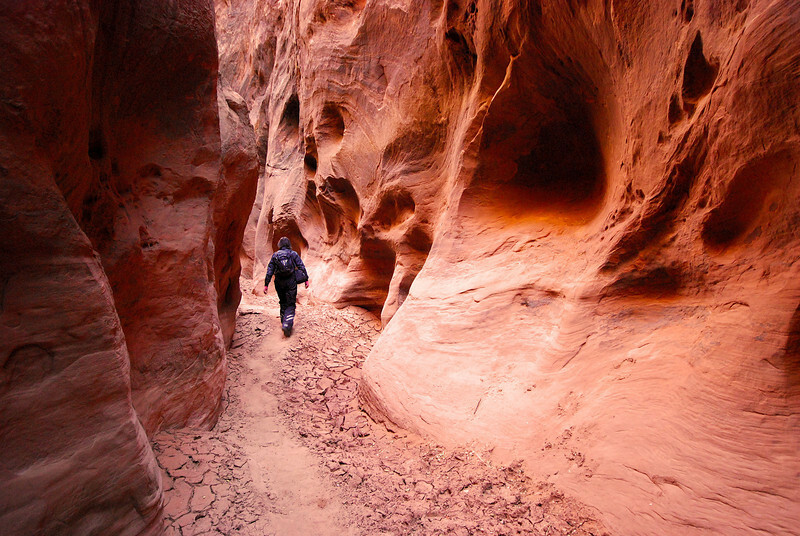 We are hiking part of Buckskin Gulch, which is 21 kms long. We can't hike the entire distance because previous rainfalls have left pools of water hip deep and it's too cold to wade through them. 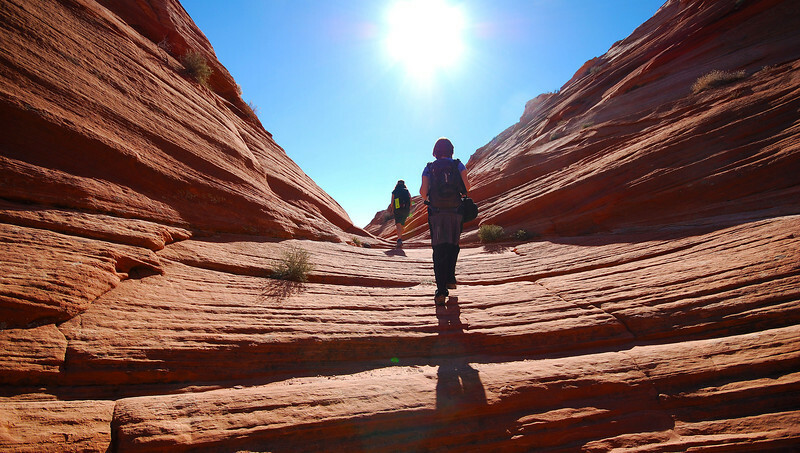 In warmer weather, hikers bring a tent and break up the Buckskin Gulch hike over a few days, wading through the much smaller pools in the heat of the Utah summer. 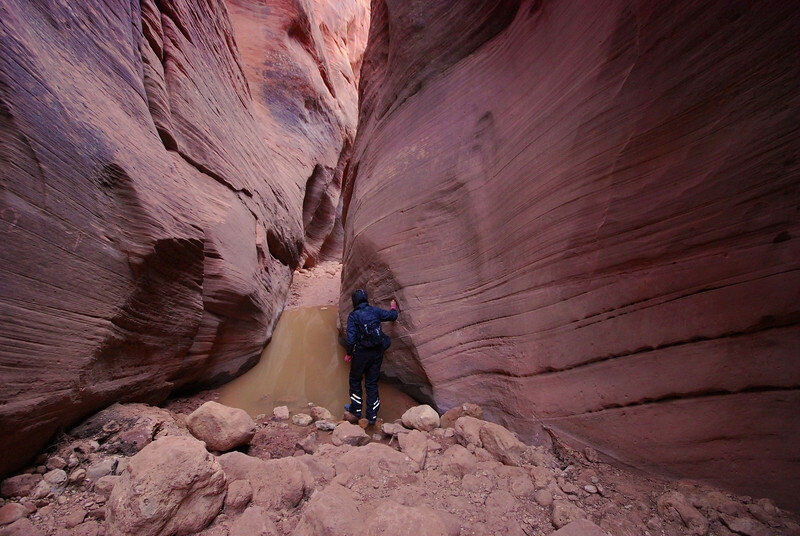 We encounter our first pool of water at Buckskin Gulch. 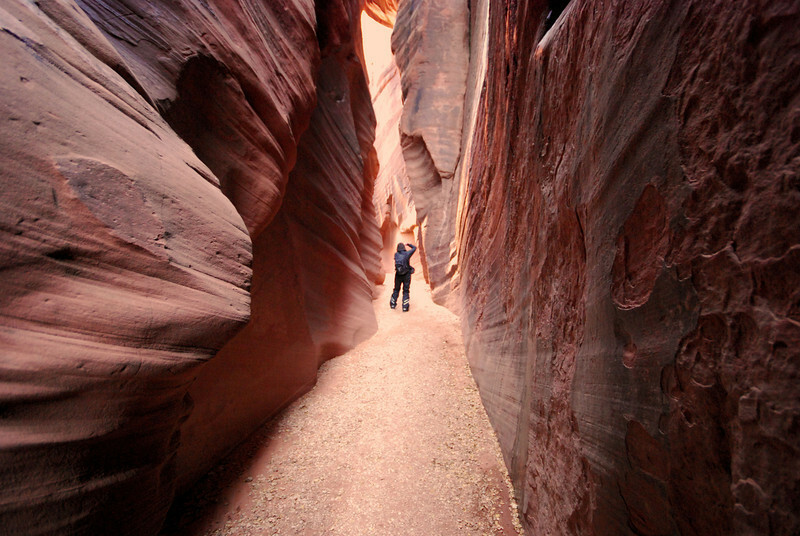 The BLM office warned us there would be much deeper ahead, so we decide to turn back here. 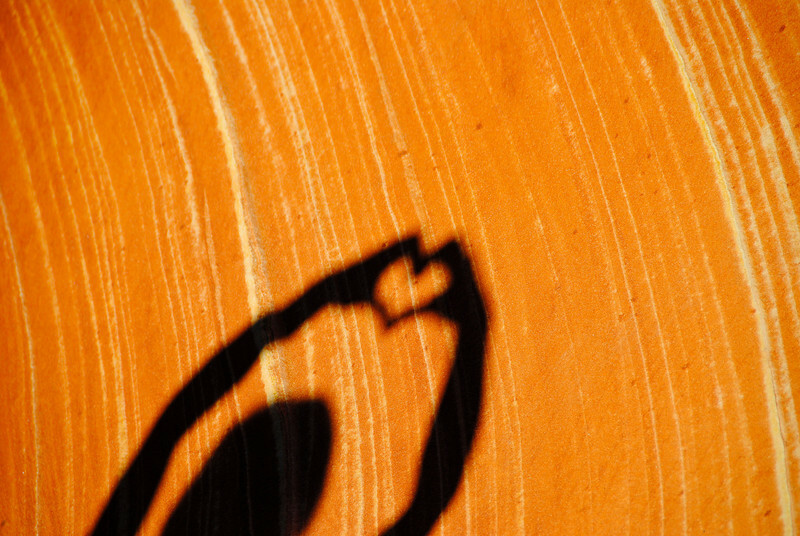 In the summer, the reflections of the sun streaming down the top of the canyon and hitting the pools cause amazing reflections against the canyon walls, but this late in the year, the sun barely makes it overhead, leaving the canyon in shadows for most of the day. Would be fun to come back here and wade through some of the pools in July! The next morning, we show up at the BLM office again but we're disheartened when we see many more lottery hopefuls also attending - 27 in total. Our odds are much slimmer today. Our lottery number is 13. I'm not superstitious, but Neda considers this a lucky sign. When she was born, the hospital gave her a bracelet with a number matching mother to baby - her number was 13. 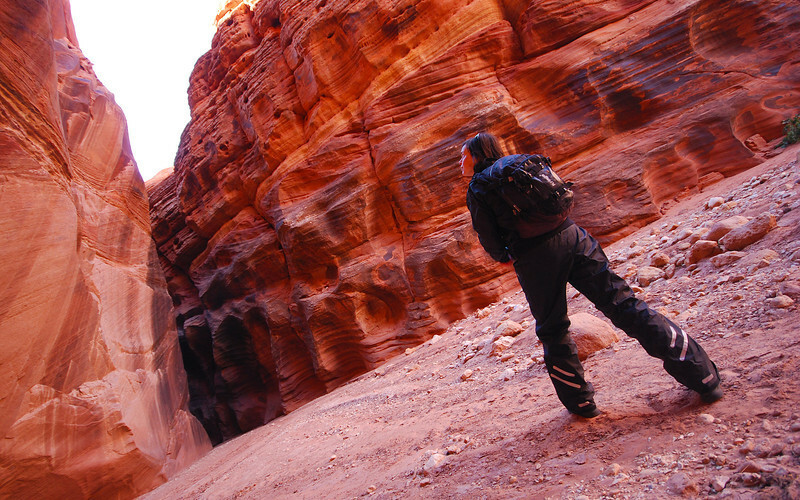 Early the next morning, we rode out to Wire Pass again where we hike much further past the slot canyons to get to The Wave. The mornings are getting very cold: -9C (-15F) and we were frozen like popsicles when we arrived. Thankfully, the temperatures would climb to a balmy 16C during the day. Along the way, we met up with a couple of other lottery winners - Sherry and Dugan from Alaska! This is it! The Wave! So surreal, the pictures don't do it justice! 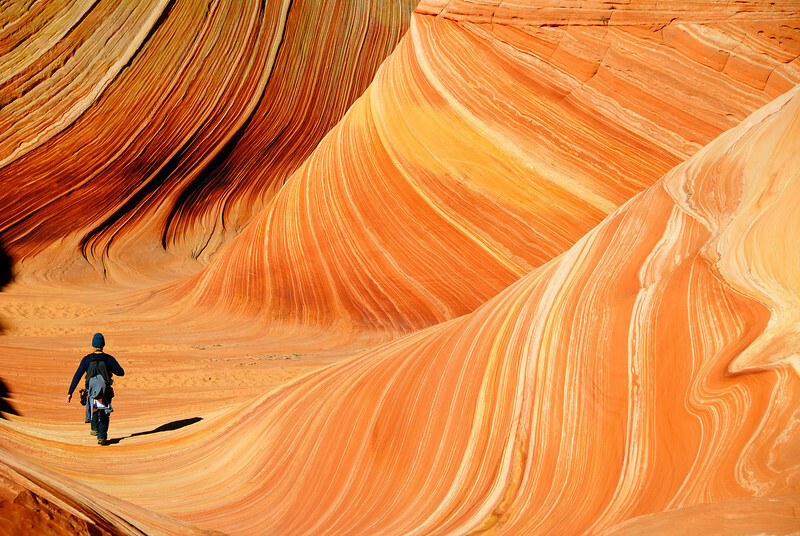 The Wave was formed when 190-million year old sand dunes were packed down with other layers of rock and sandstone over time, then this whole mass was slowly carved away by wind and water, leaving behind one really cool acid-trip of a sculpture! 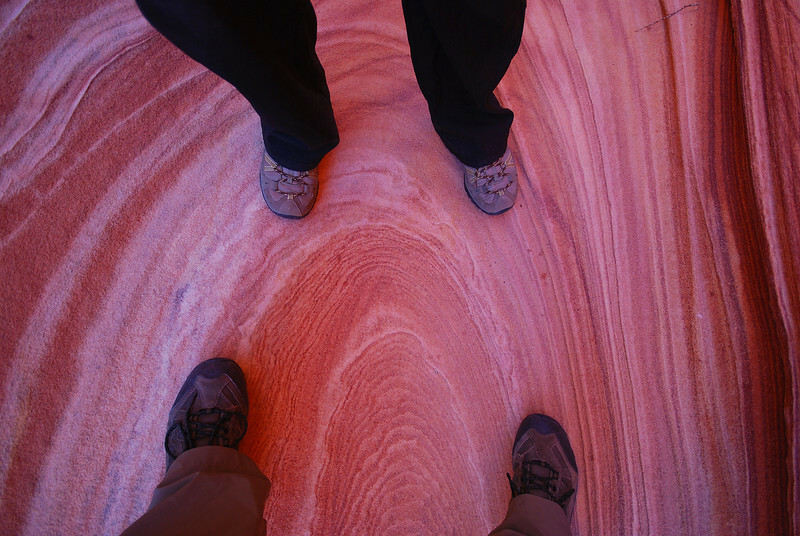 We spent 3 hours walking around the area mesmerized by the undulating layers of red rock that to me, resembled the musculature of an anatomy doll with it's skin peeled back. 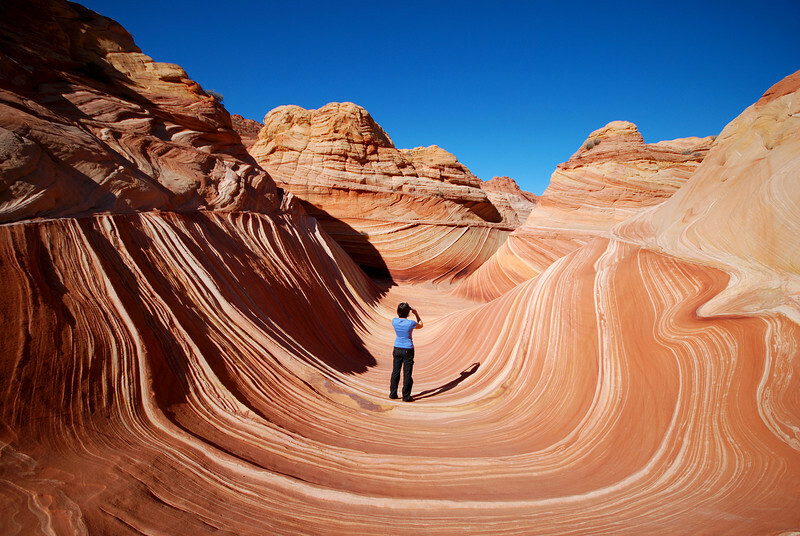 The Wave does not cover a large area, so I could imagine if the BLM opened it up for public access you would not be able to enjoy the beauty of it without having other people crammed in that small space. 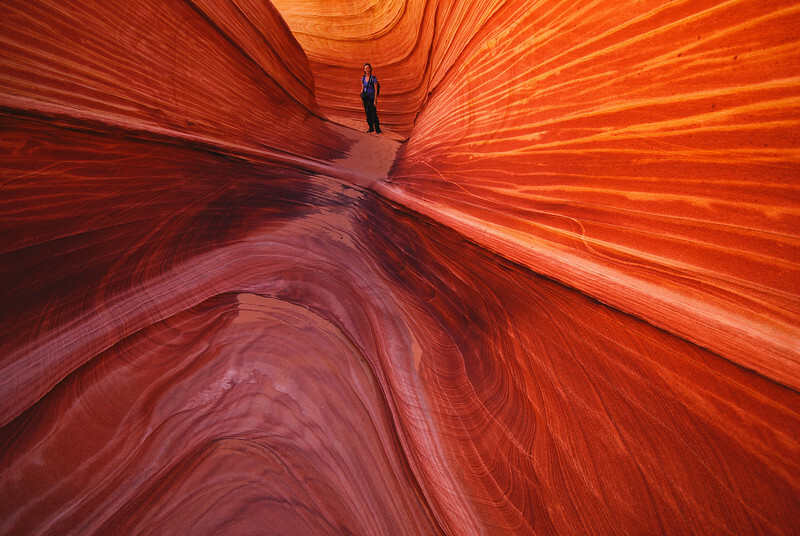 The 20 permit holders had to take turns getting shots of The Wave, while we each hid behind the hills or hiked elsewhere. I think there are actually 5 people hidden in the picture above. We've been in Utah for nearly two weeks, there's so much to see and do here, but I fear that if we don't leave soon, we'll have to convert to Mormonism and stay here permanently!